Cracked Actor is a 1975 television documentary film about the musician David Bowie, made by Alan Yentob for the BBC's Omnibus strand. It was first shown on BBC1 on 26 January 1975. It was filmed in 1974 when Bowie was struggling with cocaine addiction, and the documentary has become notorious for showing his fragile mental state during this period. The documentary depicts Bowie on tour in Los Angeles, using a mixture of documentary sequences filmed in limousines and hotels, and concert footage. Most of the concert footage was taken from a show at the Los Angeles Universal Amphitheatre on 2 September 1974. There were also excerpts from D. A. Pennebaker's concert film Ziggy Stardust and the Spiders from Mars, which had been shot at London's Hammersmith Odeon on 3 July 1973, as well as a few other performances from the tour. Cracked Actor is notable for being a source for footage of Bowie's ambitious Diamond Dogs Tour. Today I’m listening to David Bowie’s first 8 albums in chronological order, and thinking about one my all time musical heroes. In the 1970’s, I was obsessed with David Bowie. I first heard him when a local L.A. radio station broadcast his October, 1972 Santa Monica Civic concert. I ran out and bought the Ziggy Stardust album, which I LOVED, and then the reissues of his second album (Space Oddity), Hunky Dory, and my all time favorite, The Man Who Sold The World. The records blew me away like little else; so different, so original, such great songs, high concept but accessible. I played them endlessly. Soon there were bootlegs, and I bought those too. I was already a serious record collector, but enlarged my focus from finding every Jimi Hendrix record in the world to include Bowie rarities too. Record collecting was far different (and exponentially more difficult) in those pre-internet days. There were no discographies of rock artists. You depended on other collectors, friends of friends, pen-pals in foreign countries (found through ads in Melody Maker), old magazines, people who worked in record stores. Anyone who might know more than you did. In Los Angeles we were fortunate to have Tower Records and their incredible import section, and a monthly record swap meet in the parking lot of Capitol Records. In the early 70’s I was the only person in L.A. seriously collecting Bowie and Hendrix records, so things found their way to me. Somebody told me about a guy in Long Beach who had the legendary UK pressing of The Man Who Sold The World with Bowie wearing a dress on the cover, something I’d never seen. 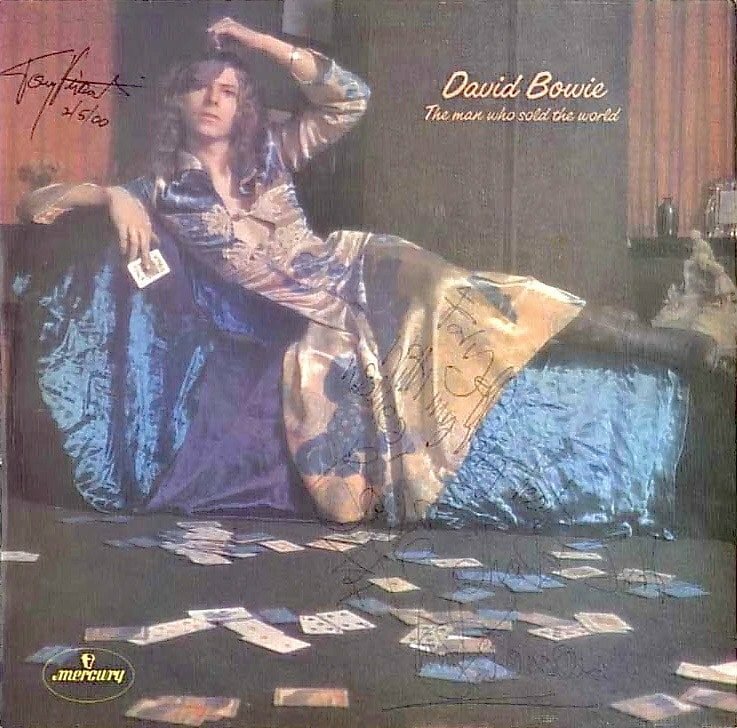 I tracked him down and paid him the outrageous sum of $25 for his mint copy of this ultra rarity, and a mint copy of Bowie’s first album on Deram. People at the swap meet though I was out of my mind–$25 for two David Bowie records! Moby Disc Records would let you reserve import LP’s before they were released, if you put down a $1.00 deposit. 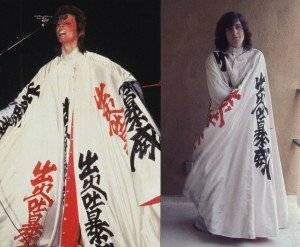 My brother and I did so for Aladdin Sane, and when I called him a few weeks later from a camping trip and he told me Moby had our albums, I left the pay phone, went and packed up my tent, and headed home. I couldn’t wait another day! We made sure to see Bowie when he came to L.A. in March 1973, at both the Long Beach Arena and Hollywood Palladium. Quite simply the best concerts I’ve ever seen, by anyone, to this day. He and the Spiders From Mars, especially the great Mick Ronson, were astounding. 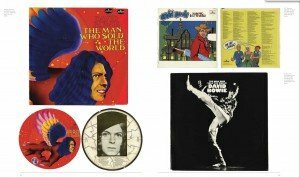 I started buying rare Bowie records from UK auction lists in Alan Betrock’s pioneering record collector zine, The Rock Marketplace (the only place collectors could buy and sell records via auction and set-sale lists.) I searched for Bowie’s earliest efforts, non-album singles on Pye and Deram. I placed classified ads in Melody Maker looking for rare singles. In 1974 my friend Harvey Kubernik, who wrote for Melody Maker, called to tell me Bowie and his band were rehearsing at that very moment at Studio Instrument Rentals in Hollywood. I rushed there and sat outside for five or six hours until Bowie’s bodyguard, Stuart George, emerged. I shyly asked him to sign a photo I had of him with Bowie, and we began to talk. I showed him the dress cover Man Who Sold The World, which he’d never seen, and he invited me inside. He brought David out to meet me, and he graciously signed it “For Jeff, with my very best wishes, Bowie ’74.” I couldn’t believe it. I’d met my hero. In 1975, I made my first trip to Europe, and on the very first day scored a copy of Bowie’s first record, “Liza Jane” by Davie Jones and The Kingbees, for 20 pounds at London’s Vintage Record Center. That was a LOT of money to pay for a single in 1975, but I was floating on air. That summer I spent every cent I had at record stores and flea markets in the UK, France, Italy, Germany, Switzerland and Holland. I loved Aladdin Sane and Pin Ups, and Diamond Dogs too, but Young Americans threw me for a loop. I loved rock music. People who liked rock hated disco, and Bowie had gone disco. But I was back soon enough, with Station to Station, Low and Heroes. Harvey continued to give me hot tips when Bowie was recording or staying in L.A., and I would stake him out. I’d begun a Bowie discography, and along with getting autographs, there was no better source of information than the man himself. I met him two or three more times, and he was always very kind–signing things, confirming his participation in singles like “I Pity The Fool” by The Manish Boys, and chatting for a few minutes. In 1975, he recorded Station to Station at Cherokee Studios in Hollywood, and on more than one occasion I waited outside until 2 or 3 AM, when he’d emerge. As always, he couldn’t have been nicer. While many love Bowie’s later albums, my interest began to drop off by the time of Lodger. Though I would check in with his albums from time to time, I found his post Spiders/Ronson and post Fripp/Eno albums far less compelling than his earlier work. But I’ve never stopped listening to (and loving) his classic albums; and have always had the utmost respect for him as a continunally evolving, boundary pushing artist. So his death yesterday hit me hard. As I was processing it, I realized, yes, it’s very sad. But we are lucky indeed to have so much great music (and filmed performances) to savor for years to come. So blast Ziggy, or Aladdin Sane, or Hunky Dory. Or watch the Ziggy farewell concert, or sample Black Star, released only two days before his death. Few will leave as enduring a legacy as David Bowie. Let’s make the most of it.